Use your garden zucchinis for a tasty brownie snack. Whisk sugar, oil, vanilla, and zucchini till blended. Stir in remaining ingredients. Spread into a greased 9×13" pan. Bake at 350 for 30-35 minutes or till toothpick comes out clean. Frost with chocolate frosting. Stir together butter and cocoa till smooth. Beat in remaining ingredients, adding milk till it is the consistency you like. -If you have zucchini haters, peel the zucchini before you add it. No one will even know it's there! -It's not a typo, this recipe has no eggs. 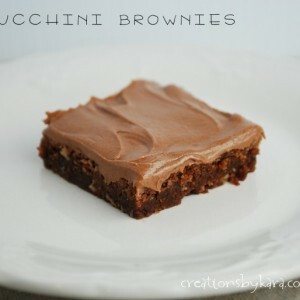 Brownies Recipe: Healthy Zucchini Brownies!